Santa Clara County Vector Control District officials said Monday that the first instance of West Nile virus in the county this year has been reported after a dead crow found in the city of Santa Clara tested positive for the virus. According to the district, crews will begin trapping adult mosquitoes in the area where the virus was discovered and will have results early next week. "This year, we're having a calm West Nile virus season," District Manager Nayer Zahiri said in a statement. The county and state are enjoying a low-activity season with the virus, as statewide only 115 dead birds are confirmed to have the virus as opposed to 718 at the same time last year, according to the district. West Nile virus causes mild to severe flu-like symptoms such as fever, headache, body aches, neurological symptoms and death. The elderly and those with weak immune systems are the most vulnerable to the virus. 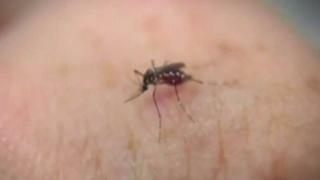 No human cases or positive mosquitoes have been discovered in Santa Clara County this year. The district is asking residents who find fresh bird carcasses to contact the California West Nile virus hotline at (877) WNV-BIRD.